Banks and excavations greater than 4 feet MUST be sloped or otherwise retained. If you have the room to slope the amount of slope must not exceed the maximum allowed. 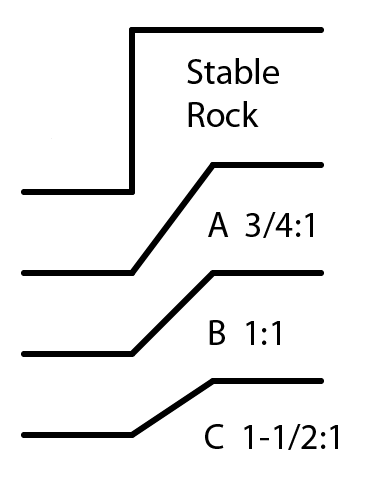 To determine the maximum allowable slope for an excavation you need to know the soil type in the area. Remember that ALL of these sloped excavations have a maximum depth of 20 FEET, any deeper than that and you must use some form of shoring or layering. accordng to OSHA the slope can never exceed 1 : 2. Solid mineral material that remains upright, stable, and intact when it is excavated.